Pondless waterfalls are ideal when you love the beauty of a waterfall but are reluctant about pond maintenance. You can have a pondless waterfall custom built for your yard. Plus, it’s safe for small children. Even without a visible pond, it still manages to create a relaxing scenery that you can enjoy with your family from day to night. You still get to enjoy the soothing sound of the moving water, and skip maintenance worries at the same time. If you’re thinking of installing a pondless waterfall for your outdoor living space, here are few design ideas to gather inspiration from. 1. Natural waterfall. Bringing the outdoors to your home. Request your pond builder to make the structure taller and capture the look of a natural waterfall set in a forest. 2. Delicate stream bed. Here’s another pondless waterfall idea by Aquascape to upgrade your outdoor living space. It can be built near the house structure itself so even when you’re indoors, you’d still get to hear the tranquil sound of the water rushing down the shallow stream. 3. Cascading low-lying waterfalls. Great when you’re working on a small space or on a corner in your yard. This water feature is sure to attract curious kids and make adults linger for a while. 4. Designed with paving stones. Contemporary and elegant, this pondless waterfall idea featured in Houzz is built with Belgard paving stones. This would make a peaceful backdrop for entertaining your guests. 5. Under a bridge. Add drama to the setting by installing a foot bridge or a little wooden bridge across the pondless waterfall stream, inspired by this beautiful project by Sublime Water Garden. With the right choice of stones and proper arrangement, your water feature will look as though it’s part of the existing landscape. 6. Right up your patio. This relaxing view that you can indulge in right from your patio will make you look forward to staying at home even longer. 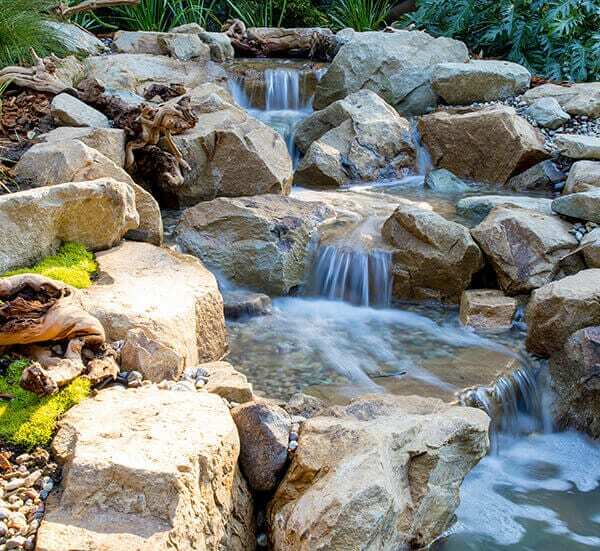 Installing a pondless waterfall is a refreshing addition to your home landscape. It fits just about any space and can be designed in several ways. If you wish to speak with a professional pond builder regarding pondless waterfall installation, we offer free consultation. Get in touch with us today at 888 600 7224 so we can talk about your dream water feature project.